My family flew me from Miami to Maracaibo, Venezuela in 1941 as a six-month-old to take up a post as a United Church missionary in Trinidad. I don’t remember that trip, but I do remember coming back as a 3 1/2-year old in 1944. Speficially, I remember the heavy green drapes used to partition off the sleeping compartments. My mother said I learned to walk on a PanAm clipper. I also seem to remember a slope to the passageway, although I may be wrong about that. As a young boy in San Francisco, I remember watching the Clippers taxi out from treasure Island. Took them quite a while to get airborne, made a heck of a noise, and flew under the Golden gate on their way West. Enjoying the comments on this site. In 1956 I flew from San Francisco to Honolulu on what I remember as a Pan Am flying boat. It was a four prop plane. I clearly recall landing on water. Yet as far as I can see, all flying boats had been decommissioned by this time. Anyone have any ideas? Another pilot from that era is Bill Nash. I think he is about 96 years old. I quoted him in a post to my blog “The Pan Am Series” and he is also a contributor to a book I co-edited, Pan American World Airways – Aviation History Through the Words of its People. These gentlemen were known as “Skygods”….. I remember an old black and white flim from maybe the 20s -40s about someone starting a flying boat service out of florida, I’ve always wanted to see that film again. Can you tell me the name of that film? I thought that since you people love Flying Boats maybe you knew of it. Trying to identify this large 2′ x 3′ publicity photo of a Pan Am Clipper flying over a 19th c clipper ship at anchor in front of a shipwreck with palm trees /island to the left. It’s a a Siskorsky S42 and the Pan Am logo is much further toward the nose than the other examples I’ve seen. It is in it’s original 1930’s frame. I’ve not opened it yet to look for the printer. It is a half tone from the original photo. I have a pic but can’t figure out how to post. Many thanks. I have a photograph of the Pan Am crew taken by my father in the late 1930’s. It was taken on the Western Union Telegraph Company property, Horta, Faial, Azores where the crew used to stay during lay-over while crossing the Atlantic. Horta was the mid-way re-fueling point between the UK and America. You can reach me at ([email protected]) I will send you a book today. R.H. McCrory, PO Box 1383, Ardmore, OK 73402. If you will include your email address I’ll upload my memoir, too big for here – some 900 KB without its pix. Small world – that paths cross after a lifetime. Mac; Give me a mail address and I will send you my book. Just a Memorial Note that Miller Logan went to his reward April 1, 2012.. Had a long PA career from Africa Limited, L-49 Constellation shakedown operation, Chief Mech London, Supt Line Maintenance Atlantic and Executive. Rest in Peace, Good Friend. I have just written to Mr. Vienneau about the Pan Am stop in Horta Fayal Azores on its way from the US to England. However, I forgot to mention that one of my recently published books named “Antonia” described Horta, and the island of Fayal in some detail. You can find it on amazon.com Kindle under my name, book title with code number B005DGB2VC. Hope this is helpful. sorry, I didn’t see the email address post so here it is. [email protected] Thanks again David Borowiec Culinary Institute of America Graduate 1978. Delighted to hear of plans for a museum on Pan Am flights to/from Shediac. these flights and his courier duties. I am researching his exploits now. facilities and layovers at that time? Thanks for your help. Dear T Carter Page: Do you have time to email me the story of the Bermuda Clipper? I’m getting close to finishing the book and would really appreciate some detail on the event. I am if you went fishing with cantanchous old Don out of Gig Harbor. There was 6-7 of us that flew out to Kafognak (or something like that) on a float plane out of Kodiac. Had a most excellent trip. is this the ernie i went to alaska with? T. Carter Page: Any chance you have time for me? I’ve really appreciate your help with the Bermuda Clipper. If you would give permission, I’d do a side bar on your father within the book. Dear T. Carter Page — any chance you can send me that story on the Bermuda Clipper? I tried to send the copies of my dad’s log book and the board of inquiry document, but I do not know how to attach anything to this “reply”. I tried a regular email, but the link address associated with your name appears to be a website. Can you send me your email address, to: [email protected]. Dear T. Carter: Oh bless you. I have searched every archive, CAB, you name — nada on this Clipper. I’ll give you a citation and send you a copy of the book. I am back in my normal work schedule. I’ll try and send you copies of what I have tonight. Dear T. Carter Page: This is Douglas Westfall, historical publisher. If you can, I’d really like to know what happened to the Bermuda Clipper when it burned up the Amazon in 1943. I have just stumbled across this blog and read your entry. I am an Australian (in Canberra) and flew aboard TEAL Solents across the Tasman (Rose Bay to Auckland) in 1953 as a boy. During the 1960s I lived close to the Rose Bay flying-boat base. In the 1970s I flew aboard Ansett’s ‘boat (can’t reca,l which one) to Lake Eucumbene & return (Rose Bay) as part of an Aviation Historical Society trip. If you are interested I can provide personal accounts. Is there anyone out there that can lead me to a photograph of the Yankee Clipper…preferable with a background that can be regognized as NY? Dear T. Carter Page: I would be interested in your photos as well. I’m still looking for information on the Bermuda Clipper, that burned in Manaus Brazil in 1943. Can you help me? I would love to see it, thanks, mabosa. Liz, ask you dad if he remembers a pilot named Charles (Charlie) Marquois (pronounced marquar). He was a friend of my dad’s who lived in CT and also flew Clippers up to 747’s. A wonderful man. He passed away a number of years ago, and I always regret I did not spend more time with him speaking of his experiences. In talking with my mom recently she relayed the story of her brother Clipper Captain Robert “Boo” McCleer being interviewed by the press in Australia many years ago. The interview was read by some of the McCleer clan who have lived Down Under since the 1800’s. With Pan Am’s help they then tracked down their lost relatives in Berkeley. My mom’s family came from the McCleer’s of shipbuilding fame. She still has stories it just takes a while to sort them out but I would be glad to pose questions to her on your behalf. My uncle flew at the same time as your dad, starting with flying boats and ending on 747’s. Robert “Boo” McCleer from Berkeley, CA was already a pilot when he joined as the youngest ever hire on his 18th birthday. Boo has long since passed but my mom, his sister, still recalls some of his exploits. Please relay this to your dad in hopes of good memories. Knowing Boo these memories may include a post flight cocktail. Carter: Thank you — how do I get in touch with you? Good site. Glad to hear of it… Keep up the good work. Ref the Boeing 307 at the Dulles Annex of the National Air and Space Museum. My dad’s photo album has a print showing that aircraft, signed by all crew members (including him as the FRO – Edmund L. Roberts) on a trip to Rio in 1940. Don’t remember the title or author, but I read that book. 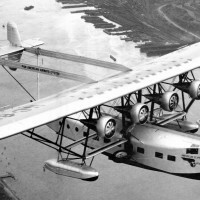 The aircraft was actually a British Empire-class flying boat, not a Pan Am clipper. A bit fanciful in that the aircraft purported to be the pursuing aircraft was identified as a modified Supermarine S6B, modified with a couple machine guns. Read somewhere that the S6B was the first aircraft clocked at 400 MPH; it had an early model Rolls-Royce Merlin engine, of Spitfire, Mustang, and Lancaster fame. I will be happy to send you what I have, both in terms of historic papers (copies) and oral history from my dad. I am currently out of town on business, and may not have all the papers on my laptop. If I am missing something, I will send what I have now, and send the rest later. I have my father’s original log book, showing that the boat was lost, but “no lives lost”. I also have a copy of the original report of the court of inquiry. Egypt via the UK and onto the U.S.A.
Do you require more info. The flying boat flown by Captain Robert Ford had the tail number: NC18602. Night over water by Ken Follett its still in print and on sale. Dear T. Carter Page: I’m looking for information on the Bermuda Clipper, that burned in Manaus Brazil in 1943. Hope you can help. I’m a historical publisher. Thanks for the info. I am presently in Tortola BVI for 6 months, so I can’t confirm the tail number on my big print. I feel certain that the last two digits were 02. Surely there is a record out there somewhere about that beautiful bird. How I would have loved to have flown one during that period. When in Manchuria I met Hal Leith from Golden, CO. He was the OSS agent that parachuted into my dad’s POW compound at Mukden the last day of the war. Hal’s amazing. He speaks 6 languages fluently: Japanese, Russian, Chinese, German, French and English. When we were there he taught the college kids at Shenyang University how to write Mandarin the old way, pre Mao. Thank you. If I have any Clipper questions I’ll definitely inquire. During the Golden Gate International Exhibition in 1939-1940 there was a PAA terminal on Treasure Island. I can remember the Clippers landing on the Bay and taxiing in. Did the terminal remain in operation after the fair closed, and if not, where in the Bay Area was it relocated? I just finished Robert Ludlum’s ‘Night Over Water’. It was a fantastic book, and really piqued my interest in flying boats.